Transcription factors play a fundamental role in the emergence and fate determination of endothelial cells during vascular development. However, the contribution of transcription factors to developmental angiogenesis remained elusive. The transcription factor Sox family is critical for various biological processes. We noticed that only SoxF members (Sox7, Sox17, and Sox18) among the whole Sox family are specifically expressed in endothelial cells and generated targeted mouse models of Sox7 and Sox17. 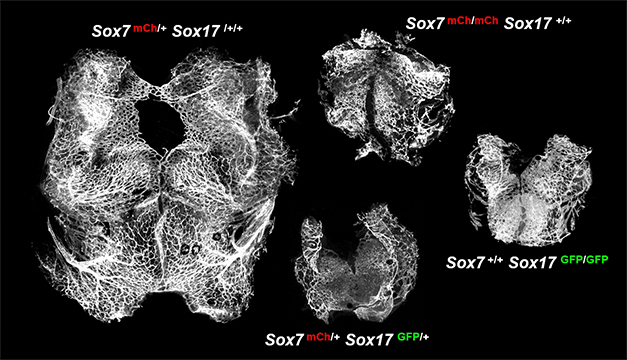 Mutant mice lacking Sox7 or Sox17 genes showed embryonic lethality with severely suppressed angiogenesis, indicating indispensable roles of Sox7 and Sox17 in developmental angiogenesis. Similarly, compound haploinsufficiency of Sox7 and Sox17 suppressed angiogenesis in embryos, suggesting that loss of any two out of four alleles of Sox7 and Sox17 genes sufficiently can induce angiogenic defect. These findings demonstrate that Sox7 and Sox17 are jointly indispensable for developmental angiogenesis and their genetic cooperation is sensitive to their collective gene dosage. different genotypes (Circ Res 2016 119: 839-852). Vascular network is intricately coordinated by multiple positive and negative regulations. VEGF signaling promotes angiogenesis by activating VEGFR2 on endothelial cells while Dll4-Notch signaling inhibits excessive angiogenesis by suppressing VEGFR2 expression. We showed that SoxF members intimately associate with VEGF and Notch signaling pathways in angiogenesis. Notch-Dll4 signaling axis promotes arterial differentiation and inhibits angiogenesis. Other groups revealed that Sox17 upregulated Dll4 expression, thereby promoting arterial differentiation. On the contrary, we found that the Notch pathway suppressed Sox17 expression at the vascular front during angiogenesis. These result elucidated the contextual-dependent molecular mechanism of Notch signaling in angiogenesis and arterial development. Notch signaling represses Sox17 expression (Circ Res 2014 115: 215-226). VEGF is one of the most powerful stimulators of angiogenesis and its activity is carefully regulated by a negative feedback control using Notch-Dll4 signaling. We observed that VEGF signaling upregulates Sox7 and Sox17 expression and then Sox7 and Sox17 promote VEGFR2 expression in angiogenic vessels, suggesting a positive feedback loop between VEGF signaling and SoxF. These findings altogether clarify the molecular mechanisms of SoxF transcription factors in developmental angiogenesis driven by VEGF signaling and braked by Notch signaling (Circ Res. 2014 115: 215-26; Circ Res. 2016 119: 839-852). feedback system (Circ Res 2016 119: 839-852). While Sox17 has been considered as a key player in vascular development, it remained unknown whether it is associated with vascular diseases. Several genomic analyses suggested Sox17 locus as one of susceptible candidate loci linked to intracranial aneurysm, which is characterized by the ballooning of an intracerebral artery. Intracranial aneurysm frequently leads to vascular rupture with high mortality. However, current treatment of intracranial aneurysm largely depends on high-risk craniotomy without any therapeutic drug. We found that Sox17 deficiency induced intracranial aneurysm under hypertensive condition. The combination of Sox17 deficiency and hypertension impairs EC junctional assembly and EC regenerative capacity. 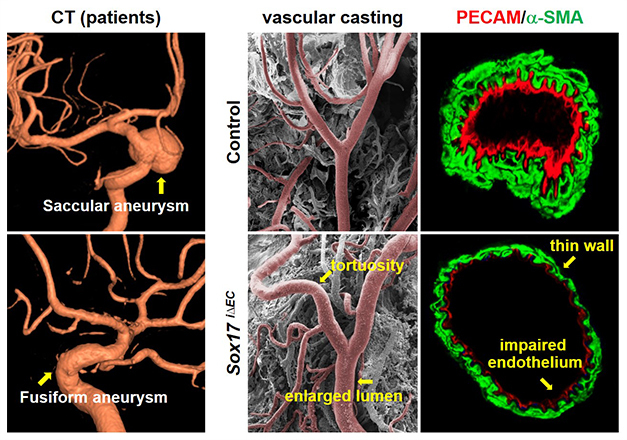 Our findings opened a new direction of intracranial aneurysm study by identifying Sox17 deficiency as a potential genetic factor, suggesting endothelial dysfunction as a novel pathogenesis, and providing a reliable disease model (Circulation 2015 131: 995-1005). 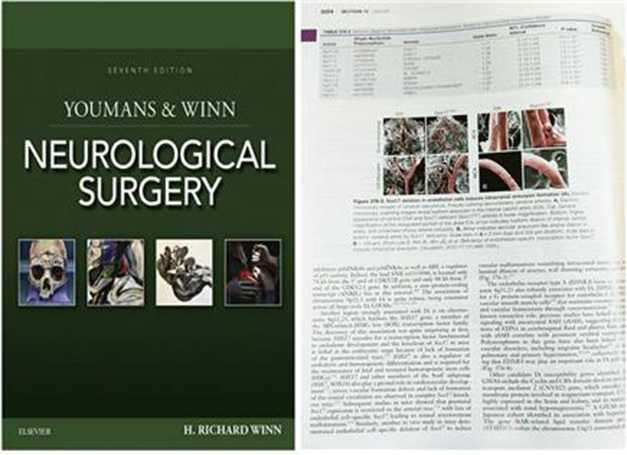 This study was highlighted in the textbook of the neurosurgery (Winn & Youmans, 2017 Youmans Neurological Surgery (7th ed. ), p 3204). ​Sox17 deficiency induces intracranial aneurysm (Circulation 2015 131: 995-1005). Tumor is characterized by excessive angiogenesis of abnormal vessels. At first, we examined the expression pattern and role of Sox17 in tumor angiogenesis by using ectopic tumor models (J Clin Invest 2013 123: 418-431). To study tumor vessels in more clinically relevant tumor models, we then have used orthotopic glioma models. We found that Sox7 was specifically expressed in glioma ECs, but not in normal brain ECs while Sox17 was downregulated in glioma ECs. Endothelial Sox7 deletion suppressed VEGFR2 expression, vascular abnormality, hypoxia-driven invasion, and glioma growth. Conversely, Sox17 deletion exacerbated these phenotypes by up-regulating Sox7 in glioma ECs. Anti-VEGFR2 antibody treatment delayed glioma growth by normalizing Sox17-deficient abnormal vessels with high Sox7 levels but promoted it by regressing Sox7-deficient vessels, recapitulating variable therapeutic responses to antiangiogenic therapy in high-grade glioma patients (J Exp Med 2018 215: 963-983). Our research group is leading the investigation on SoxF transcription factors in the field of vascular biology by providing conceptual advance with high impact and creating a platform for future translational research. Copyright (C) 2017, KAIST GSMSE VH&D , All Rights Reserved.